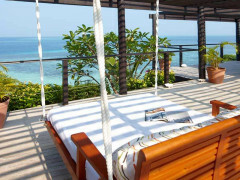 Ever Imagined Lazing Away The Days On Your Very Own Island? There’s no Beatles-inspired tangerine trees or marmalade skies, but Wadigi Private Island is as close to paradise as you’re going to find in this lifetime and on this earth. If hell is other people, as “God’s Island’s” only guests, you’ll bask in 5-star luxury, laze on your villa’s deck, walk the pristine, white-sanded beaches and swim in the immaculate Pacific. You’ll truly get to understand the meaning of the word privacy as you’re hidden away in the Mamanuca Islands, a ten-minute helicopter ride from the Fiji mainland. Why Stay In A Hotel When You Can Have A Whole Island? With their opening salutation of “Bula!”, Fijians are some of the friendliest, most hospitable people on the planet… and some of the best chefs to boot! Not one, but two personal gourmet chefs will serve you fresh tropical seafood and Fijian produce, decadent desserts and the best Australian and French wines on your villa deck, next to your pool or even as torch-lit dinner on the beach! Activities range from snorkelling amongst the coral, windsurfing and paragliding to dolphin watching, fishing and massage but like everything in life, even paradise comes with one downside… watch out for “The Silent Killer of the Pacific” - falling coconuts! Just you, whoever you choose and no-one else! 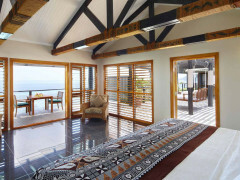 5-star Fijian hospitality and chefs are amazing, trust us! Did we mention it's called ""God's Island""?